Santec has right blend of expertise and engineering capabilities to design and develop Transfer & Injection Moulding Presses for different application requirements. The company utilizes latest technology to provide presses that are highly efficient and cost-effective. Different types of Transfer & Injection Moulding Presses that are available in the market includes Transfer Moulding Presses for Rubbers and Vertical Type Rubber Injection Molding Machines. 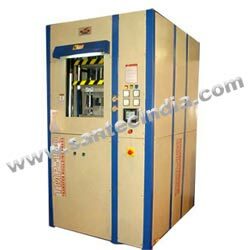 Transfer moulding presses are specially designed for production of rubber parts & DMC/ urea or switch gears or electrical parts. These presses feature advanced facilities including touch type panel screen, sliding & ejector arrangement, etc. Vertical Type Rubber Injection Moulding Machine features innovative design that employs two- stage material supply. It expels bubble out of the raw material in an effective way and there is on waste material left in the injection system. These machines are ideal for polygin, polyhedron & other complicated products especially used in sports, medial automobile & electrical applications.